‘The Crimson Horror’ is another bit of a surprise episode because it brings back the Doctor-lite aspect that hasn’t really been around since the Tennant years. There’s a decent mystery in play regarding Sweetville, but both the Doctor and Clara are more a part of that mystery rather than ones investigating and seeking a resolution until the end. It’s an interesting approach, especially considering that this is the programme’s fiftieth anniversary year, but maybe not the best one to take in this instance even if it suited the story. The setup is that the Doctor’s image appears in a victim’s eyes just before death, prompting the return of Jenny, Strax, and Madame Vastra as a trio of investigators. For the first time, though, it’s Catrin Stewart’s Jenny who really takes the lead in events, a welcome shift in the dynamic even as the other two remain useful in their own right and Strax in particular continues to deliver more comedic moments. People around the area are being discovered covered in red, dubbed the crimson horror by unaffected locals. While the locals focus on superstition and fear, though, the detectives soon shift their focus to Winifred Gillyflower, a woman unafraid to tell anyone who will listen about the joy and respite that Sweetville offers compared to the world at large. Dame Diana Rigg is perfectly suited for the role, and the scenes in which she shares time with her real-world daughter Rachael Stirling are particularly strong. 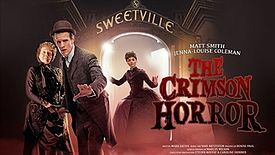 The setup treads on familiar ground for Doctor Who and many science fiction tales as the seeming utopia of Sweetville is proved a farce with a far more dangerous force in play behind the scenes. Yet while all of the assembled characters are interesting and get plenty of time to shine, it’s the background information about Gillyflower and the way in which it’s portrayed that is particularly engaging. Using a unique filming technique, it is quickly revealed that Gillyflower preserves the best of the people she brings into Sweetville- including the Doctor- in the red covering, dumping the rest in the canal as she attempts to follow the orders of Mr Sweet. Unfortunately, the actual reveal of Mr Sweet being a small red parasite living under Gillyflower’s top fails to resonate, and the fact that Ada smashes him soon after means that he leaves little impact. The episode does a good job of balancing humour and seriousness throughout, Strax of course stealing the comic highlights but Clara getting in a very fun reaction to the use of a chair instead of the ever-complex and necessary sonic screwdriver. Matt Smith gets to try on a new accent, and his (and his screwdriver’s) reaction to Jenny effortlessly taking down a foe is priceless. The Paternoster Gang trio is pitch perfect through this episode, benefiting from the detective storyline as Mark Gatiss is able to infuse some of his work from Sherlock into the proceedings, and if ever there were a question of them being able to sustain a show by themselves, this is the proof that they can. The ending of the episode sees Clara back at home where the two children she babysits seem to have discovered that she time travels, and this looks set to have some immediate consequences in the upcoming Cyberman episode ‘Nightmare in Silver.’ While no further progress was made regarding the overall mystery of Clara and the leads were strangely sidelined for a good portion of the episode, ‘The Crimson Horror’ was nonetheless an entertaining, if ultimately forgettable, episode.